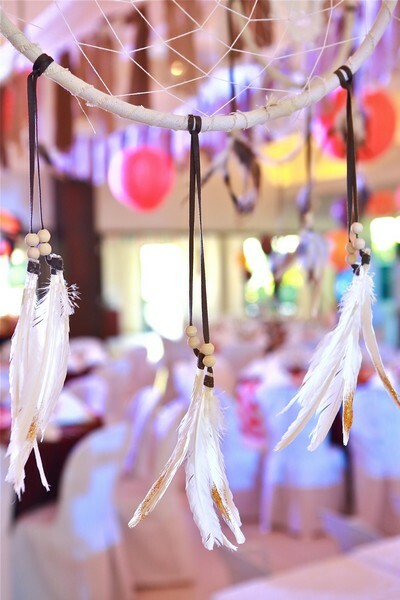 One of my more recent parties involves a theme that is more rarely used, but nonetheless, if executed well, brings about a very strong impact to all guests. 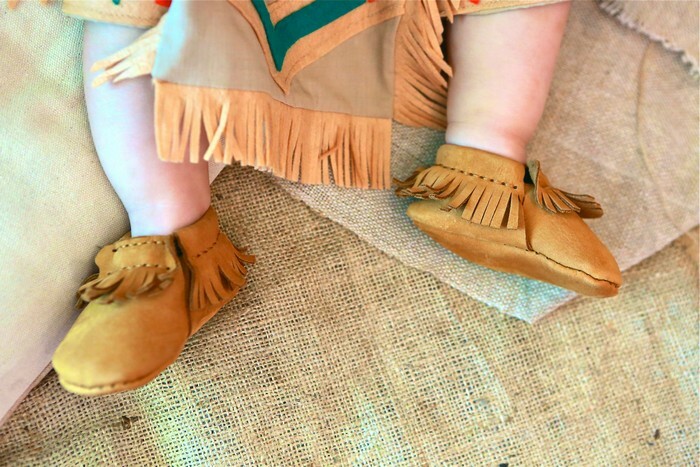 I’m talking about the theme: Native American Pow-Wow! 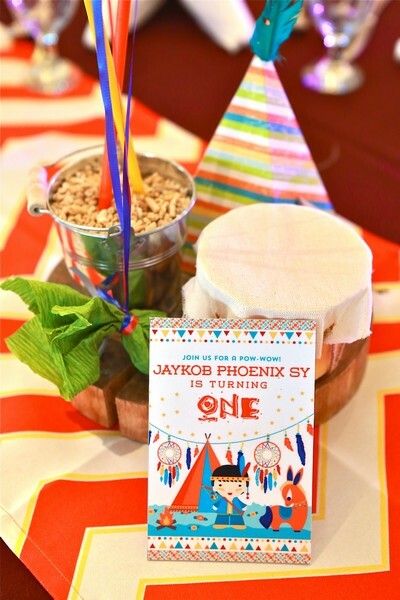 Jersh, our client, approached us with this novel idea for her son Jaykob Phoenix’s birthday celebration. 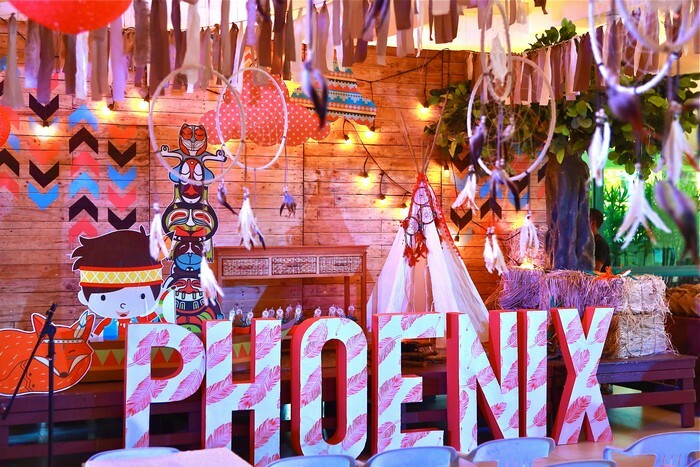 This quickly became one of my most memorable parties to date, simply because the theme is so unique, and it was one of the hardest parties I’ve ever done! 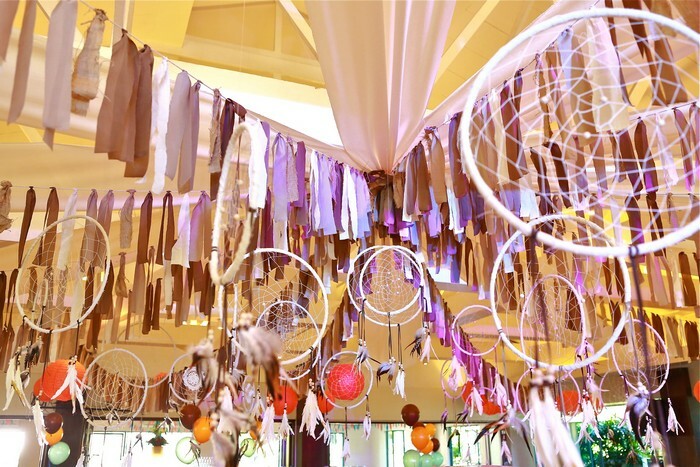 The ceiling is composed of off-white swags, dark brown and off-white fabric tassels, dark orange lanterns at the far end of the swags, and dreamcatchers in the center. 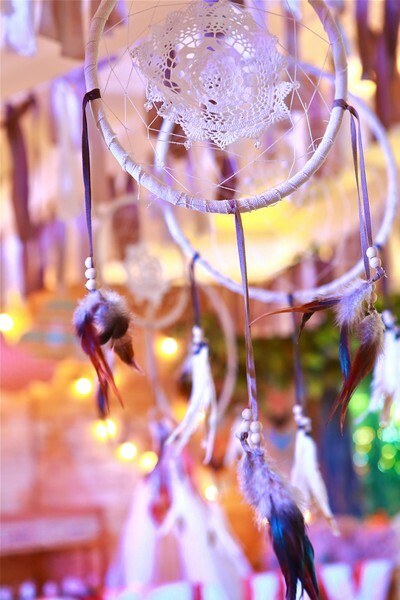 The tricky element here is the dreamcatcher. 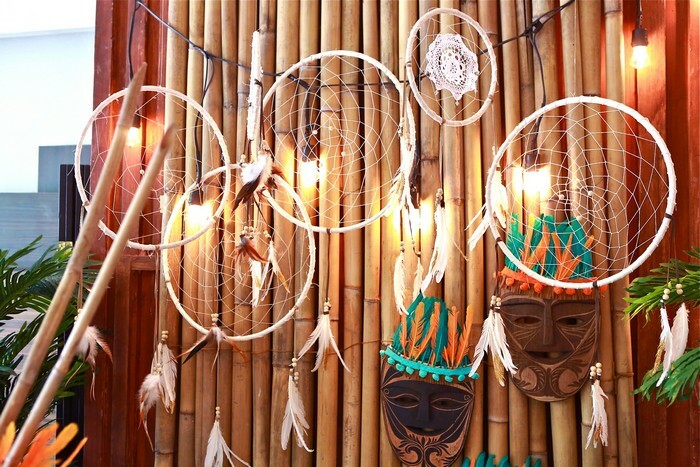 Not only are dreamcatchers quite expensive to purchase outright, I couldn’t find one that is sized large enough to make an impact on the ceiling! So, the Party Magic team and I resorted to good, old-fashioned handcrafting. 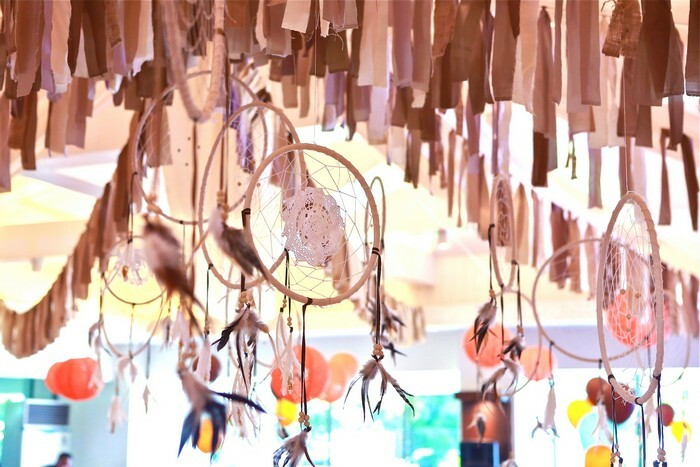 Needless to say, creating these dreamcatchers took some time (and a lot of manpower!). These are all labors of love! 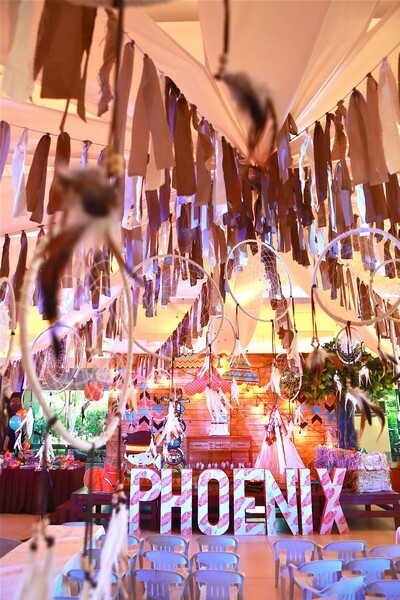 The feathers of each dreamcatcher were dipped in gold dust, to provide a more “modern” feel to the design! Aren’t they a beautiful family? Credit goes to Luxe Photography for this amazing shot, as well as all the other photos used in this post! 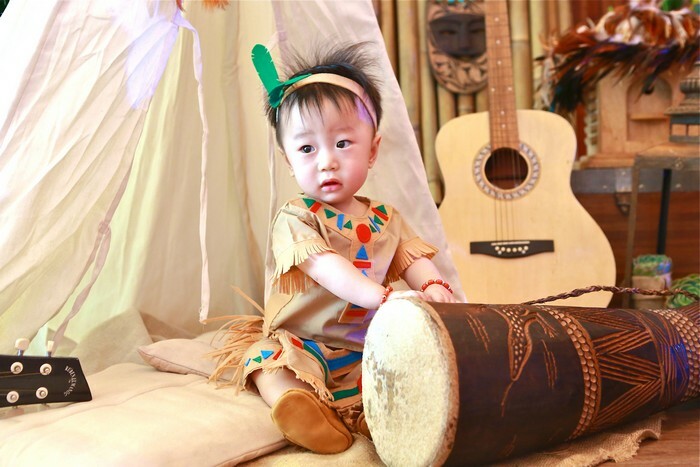 Phoenix is so cute, isn’t he! 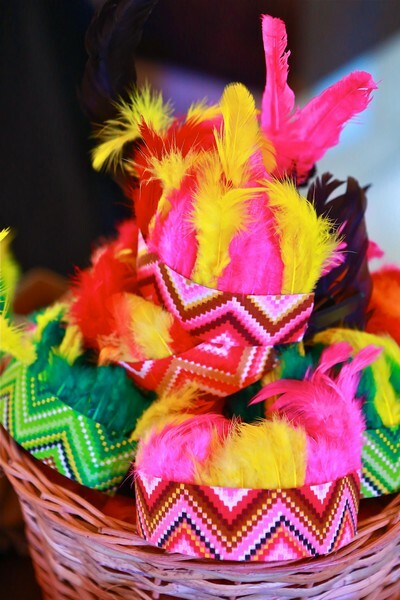 More details: check out these super cute feather headdresses, crafted by yours truly! Aren’t they adorable! Just another one of those small things that make a party memorable. 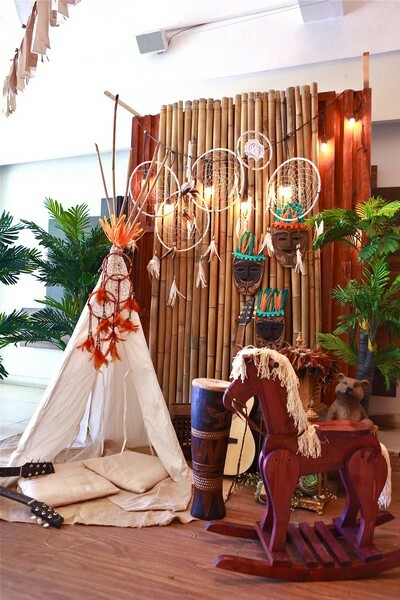 Speaking of handcrafting, other details that we created from scratch are these adorable deer taxidermy paper crafts and miniature paper teepee tents for the centerpiece! 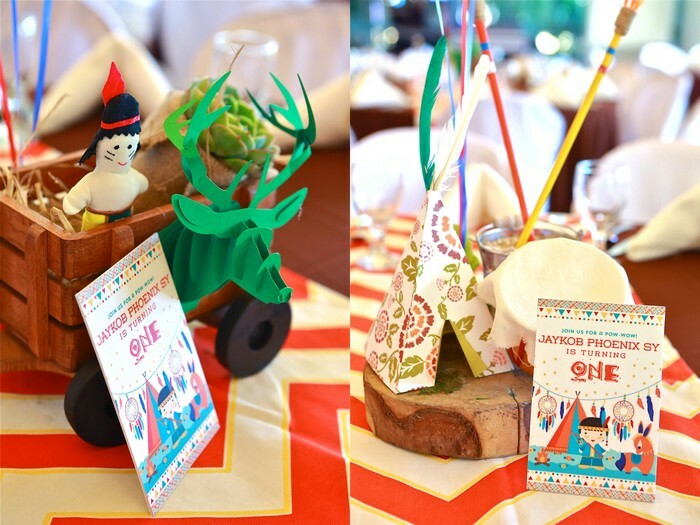 That beautiful graphic on the table was based on the invitation designed by the amazing Sygryd Fuentes! 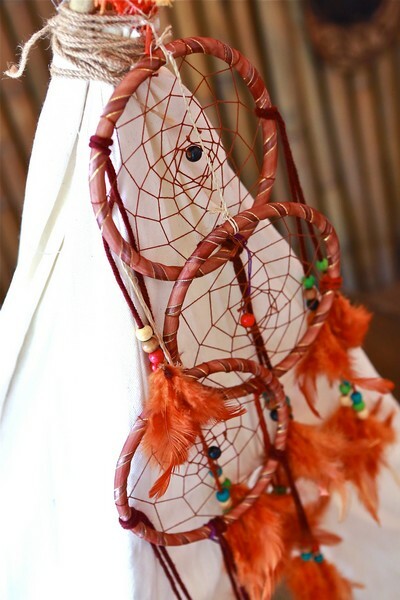 I like it so much because it veers away from the typical Pow Wow color scheme and ventures into a refreshing color palette, which uses teal and orange as its main theme. 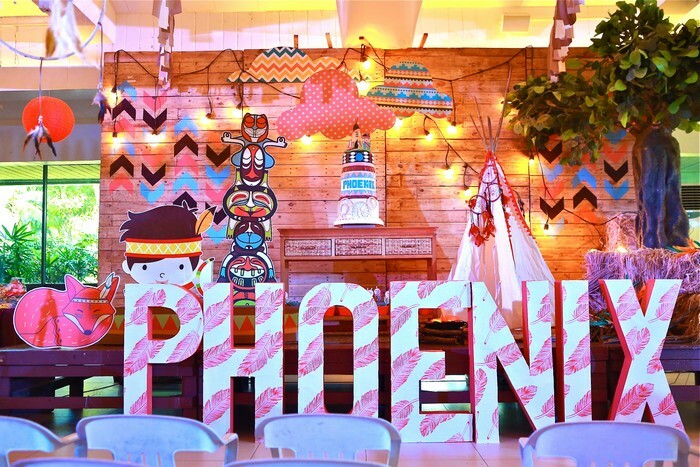 My philosophy on styling kiddie parties has always remained the same: do a sophisticated aesthetic, but never be too serious. It’s great that Sygryd gets this! 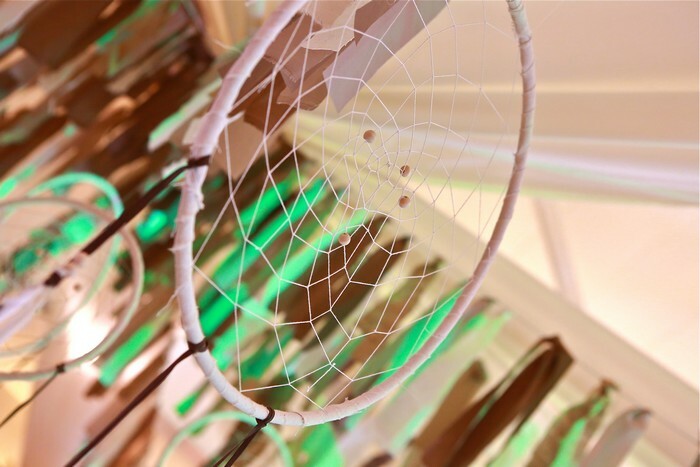 Check out Sygryd’s design company, The Playground, and be blown away. I highly recommend her work because her service is prompt, professional, and reasonably priced. Now let’s move on to the focal point: the stage! 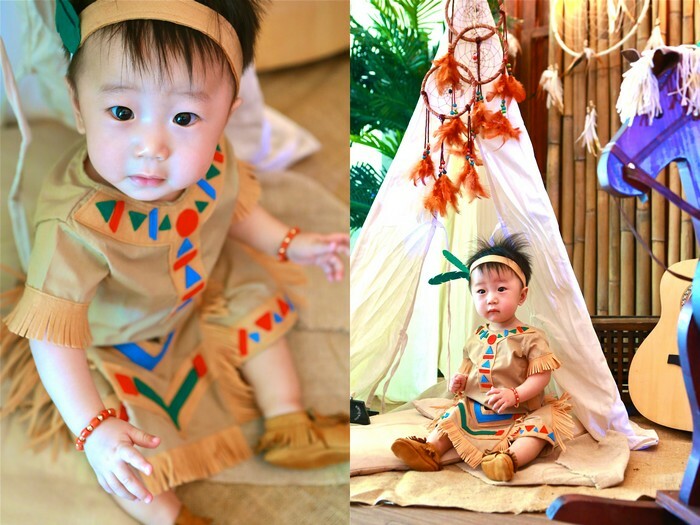 The basic concept was to recreate a scene from a Pow-Wow, thus the boy with his fox and the teepee tent, under the shade of a tree. This tree is like no other though, for it stores arrows, weapons of destruction! 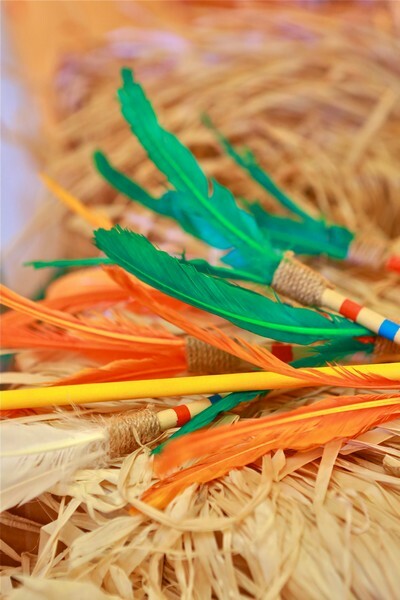 Of course, these are not real arrows, but really just painted sticks with feathers attached to their ends. Real arrow or not, though, it was a big hit with the kids! I know because almost none were left after the party! 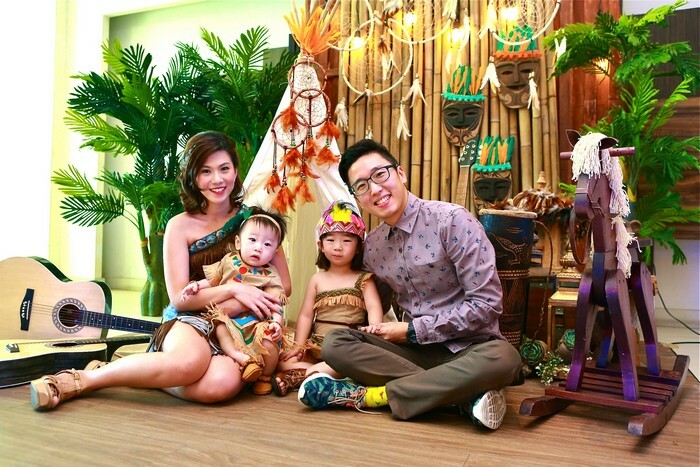 The party was held at Greenmeadows Clubhouse. 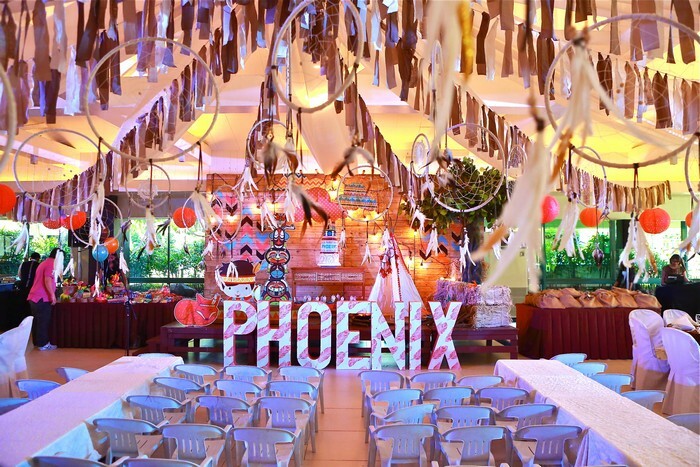 Because of the client’s large number of guests, however, she availed of the main area plus the low-ceiling function rooms at the back, where the buffet table was set. 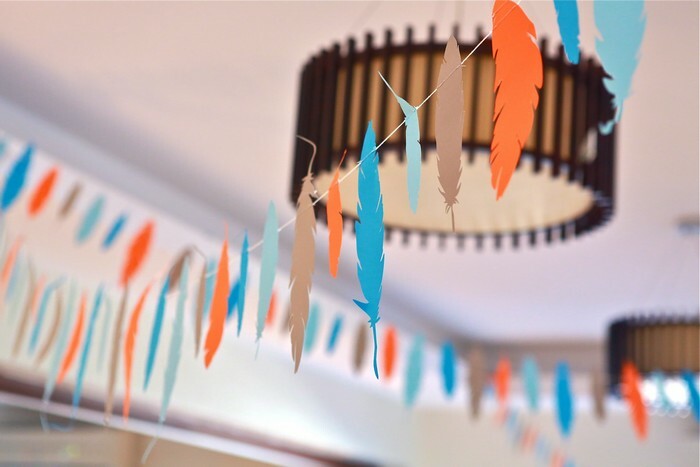 Because of the low ceiling and small space, the Party Magic team and I decided to dress up the area with 1,000 pieces of paper feather garlands, cut and sewn together with lots of sweat (and love!). The happiest of birthdays to the man of hour, Jaykob Phoenix! Hope you and your family enjoyed the party as much as I did.